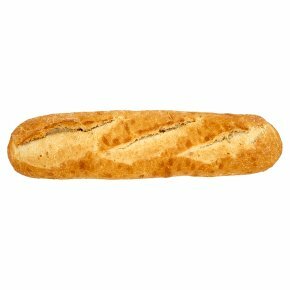 Produced with a fine blend of French flour, traditional mixing methods and an artisan recipe, respecting the history of traditional French bread production methods. The subtle taste of sourdough coupled with long fermentations gives this bread a unique aroma, whilst the long resting time of the dough gives an open soft crumb structure throughout the bread. This large loaf is great for open sandwiches and an ideal accompaniment to cold meats, soups and cheese Best consumed on day of purchase. Also great toasted or refreshed in the oven the following day. INGREDIENTS: wheat flour, sourdough (wheat flour, water), water, salt, starter culture, yeast, wheat gluten, malted wheat flour. Allergy Advice For allergens, including cereals containing gluten, see ingredients in bold May also contain nuts, peanuts and sesame. May contain: nuts and sesame.